A new streak is underway! After writing on my dissertation for at least 30 consecutive minutes every day for nearly five months, my writing streak finally died. The feeling of relief was immediate—it was as if a huge burden of stress was instantly lifted from my shoulders. I relaxed, slept, recovered from surgery without guilt, and even decorated the Christmas tree. It was wonderful! Unfortunately, joy built upon false pretenses isn’t true joy. It wasn’t long before my feelings of relaxation were marred by a quiet voice whispering “write…you should be writing…you’re off work for only 3 weeks, and are wasting this wonderful opportunity to make great progress on your dissertation.” I tried to argue with the voice, reminding it that taking a few short days off was perfectly acceptable, and that I had worked hard for the last few months and had earned a short break. I even played the “poor me” card, noting that I had been sick for months, and that sick people needed to rest and avoid stress. None of my arguments worked. As the days went by, instead of going away, the little voice just got louder. Finally, resigned to the fact that I was going to lose the argument, I opened my writing log file to assess the damage. I was shocked to see that I had not touched my dissertation for an entire 16 days. I really didn’t think it had been longer than a week…how did the days slip through my fingers so fast? So, now I have a 16-day hiding-from-my-dissertation streak. How long do you think I can keep it up? Well, so much for writing every day until I graduate. So much for ending the writing streak on my own terms, like Cal Ripken. So much for thinking that using a nifty spreadsheet formula to track my writing days would keep me from hiding from my dissertation. It’s over. And how? Did I decide I simply had too much on my plate this week and that I should prioritize, and spend my time on more important things? Did I decide that quality was more important than quantity, and that there was no point spending half an hour engaged in ramblings only marginally related to my dissertation? Did I sacrifice my daily writing time in order to aid a friend in distress? No, unfortunately it was for none of these reasons. I’m ashamed to say it, but the reason my wonderful little writing streak died at 145 days is…. I forgot to write. Yes, I simply forgot. When I remembered, it was 4:00 a.m. and I had just gone to bed, having stayed up late grading tests that had fallen behind, and nursing a swollen achy head and nose from the sinus-drilling operation two days earlier. Yes, I managed to write (somewhat incoherently) the night of my surgery, and (somewhat more coherently) the next day, but on the third day, I just flat forgot. When I remembered I had not written that day, I briefly considered getting back up to do it. At that point, I realized the writing streak had gotten out of control and acquired a life of its own, a life it never should have been allowed to have. As my brother DMG astutely pointed out, there is no way I could write more than 6 days straight and expect the writing to be useful. Since usefulness is a low priority purpose for my writing, this had not worried me much. But as I ponder my unexpected sadness at the accidental death of my writing streak, I realize that feeding and tracking a writing streak can cause another danger, at least as perilous as the hiding-from-the dissertation danger it was designed to prevent. The new danger is that the write-every-day habit could obscure the true status of my dissertation progress. It is entirely possible that because I am writing every day, I might deceive myself into thinking I am actually getting somewhere. So now, I just don’t know what to do. Should I start tracking a new writing streak, as of tomorrow? (Today has been a long day, no point in starting today what could be started tomorrow.) Should I quit tracking my writing and go back to hiding from my dissertation? Should I redefine my writing streak somehow, perhaps using an hours-per-week requirement, or forcing non-writing days into the schedule every so often? Should I attach quality points/rankings to my writing sessions so I will be forced to write something useful? The only other time I redefined my official definition for a writing day, I predicted that disaster could follow such a violation of conscience. Sure, enough, just 9 days later, my writing streak died. No more remedial swimming…we’re Island Hoppers! Swim to the deep end, turn around on either axis, and swim back. Float/swim on our back for what seems like forever…on our back we can even steer! Interestingly, whenever we try a new skill, it seems one of us will pick it up quickly, and the other will have a really hard time. Yegan naturally breathes on the left, I breathe on the right. We’re now both practicing so we can breathe on the weak side. Yegan floats, I sink. Whenever we are asked to do any exercise that involves going to the bottom of the pool and staying there, I excel. I let out my air and drop effortlessly to the bottom and can sit on the floor of the pool as long as I like. When Yegan tries it, she goes down a little way and then helplessly floats to the surface. She really needs to work on this. Yegan has a naturally good flutter kick. I am gifted at the frog kick. Our instructor says it is because her toes naturally point, and my ankles naturally flex, making it easy for me to bend my knees out to the side and smack my legs together. Somehow, the notion of naturally pointing toes conveys a picture of grace, maybe even a ballerina….does kicking like a frog evoke such thoughts of elegance and beauty? I try not to dwell on it, lest envy take root. Yegan, despite being more terrified than me in the beginning, is better at diving headfirst. She slides right into the water at a near-vertical angle. I tend to go too horizontal, almost belly-flopping at times. However, last week I discovered I was much better than Yegan at the cannonball, in which we jump up, hug our knees to our chest, and land in the water with a giant splash. We both have plenty to work on, but we have come so far. As of last week, after 4 months of lessons, our instructor John announced that we are no longer Beachcombers—we are now Island Hoppers! Hooray! He even seemed optimistic that we could eventually reach the next grade above Island Hoppers, which is Masters. Apparently Masters swimming has higher standards than the Masters division of running, in which the only qualification is to be at least 40 years old. While it has been wonderful to learn how to swim, perhaps the neatest thing about our swimming lessons has been that a good friend has become a better friend. If you want to grow a friendship, I highly recommend that you learn a brand-new skill together. For maximum benefit, the learning experience should involve (1) being scared together, (2) frequent laughs at one another’s failings, and (3) head-on collisions, and subsequent entanglements, in 9 feet of water, wearing nothing but spandex and silicone. Do these things, and any friendship is bound to grow richer. Well, my conscience isn’t completely at ease about it, but I decided to do it anyway. Whoa, that should immediately set off alarm bells—any action preceded by such a statement is bound to have negative results. This past summer, in an effort to motivate myself to establish a habit of daily writing on my dissertation, I created a minimum requirement for a day to count as a “writing day” and thus extend whatever “writing streak” I happen to be on at the time. Amazingly, the writing streak that began this summer grew to 100 days, and now stands at 136. Wow, I can’t believe I have written every single day for four and a half months!! If all of those writing days had been serious efforts, undertaken with a clear and focused mind, I would be much further along on my paper, and would probably already have my research proposal approved. Unfortunately, many of the writing sessions have been foggy ramblings, conducted late at night with no plan whatsoever except to add a day to my writing streak. My writing professor, whom I credit for convincing me to track my writing minutes, thought I should count all writing in my log, whether it is journaling, or brainstorming about my research project, or blog-writing, or whatever. Against her advice, I decided to exclude recreational blog writing, fearing that counting it would give me a way-too-easy method of hiding from my dissertation. I have had a change of heart….or perhaps I have violated my conscience, and have taken the first step of a long descent into a dark swamp, in which dropping out of grad school and swearing off writing forever are minor compared to all the other transgressions I will commit in that place. Here’s the new definition for a writing day: Blog writing counts, as long as it is about the dissertation. So if I don’t feel like writing my dissertation, I am allowed to blog about why I don’t want to write my dissertation, and I can count this as a writing day (as long as I write for 30 consecutive minutes). Hopefully this will have the effect of renewing my motivation, so that I will want to write on the actual dissertation the next day. If not, hopefully after I create 5 blog entries on 5 consecutive days about how I don’t want to work on my paper, shame will set in, or at least a niggling feeling that something might be wrong. This should still have the effect of making it difficult (unfortunately not impossible) to hide from my dissertation. In fact, posting my writing about not writing on a public blog is far likelier to have a positive effect than hiding my writing about not writing in a file on my computer. So, well-wishing friends, is this a good thing? Or have I completely blown it? Or does it even matter? I just don’t know. Like Frodo upon Amon Hen, trying to decide which road to take, I mistrust the way that seems easier. But hey, I just finished my writing session for the day—this counts!! Now I can go to bed without even looking at my dissertation. Never mind, I have nothing to worry about—this new definition is great! You’ve got to have grist before you can grind. My writing has recently stalled. The problem is this: nearly all of it has been in 30-60-minute chunks at the ends of long tiring days. These writing sessions have been conducted entirely without a plan and their only purpose has been to sustain my writing streak. Prior to the current rut, I used a combination of short sessions and all-day and all-night writing binges to edit/polish a couple major projects and send them off to their respective judges. I do not yet know the fate of my papers, but they are out of my hands and there is no reason to edit them any more at this time. So, my writing efforts must return to longer-term projects, particularly the first three chapters of my dissertation. The problem is that in order to write anything more on these chapters, I need to invest significant time in library research and puzzling through confusing statistical concepts. This cannot be done in half an hour. Even 2 hours is really not enough—it takes me that long just to figure out what books I should look at! It’s a bit like when Saruman’s emissaries tore down the old mill in Hobbiton and replaced it with a bigger, louder, more modern mill, “full o’wheels and outlandish contraptions”. As Farmer Cotton explained to Merry Brandybuck, “you’ve got to have grist before you can grind, and there was no more for the new mill to do than the old”. I have a great new writing habit (amazingly, it really has become a habit! ), but it doesn’t do me any good unless I have something to write about. I need to dedicate some long sessions, 4+ hours, to non-writing research activity, something I have so far rarely done in a normal work week. I have done it (and liked it!) during breaks between semesters, when I don’t have work responsibilities and know I can catch up on sleep afterwards. So, I need to either trick myself into thinking I’m on vacation, or figure out a way to fit it into my normal schedule (using the words “normal” and “schedule” rather loosely). So, next weekend must include several hours of deciphering statistics books and working problems. If I don’t find some grist soon, I might as well tear down my wonderful new writing model and replace it with a garden, as the hobbits did with the smoking new mill. Hmmmm…..a peaceful garden sounds rather nice. No, don’t even think about it—in this case, the new model really is better than the old. This hobbit just needs to get to work! Yes, it’s official: Last night, for the 100th day in a row, I spent 30 consecutive minutes writing my paper. Earlier this summer, I finally decided to actually try the “write every day” advice I have heard so often, and 83 days ago I created a written writing streak definition so I wouldn’t be tempted to cheat. I must confess that, while I haven’t technically cheated by claiming false information in my writing log, there were many nights when my heart wasn’t in it, I was too tired to put coherent sentences together, or my attention was distracted. During tonight’s writing session, for example, I wrote through a splitting headache while simultaneously watching the Rangers try as many ways as possible to give away what should have been their World Series victory game. It could be argued that these writing sessions are of questionable value. Runners have a name for this: “junk miles”. Junk miles are miles run for no other training purpose except to add a number to the running log. Runners are not in agreement about this--some think junk miles should be avoided, while others think all miles have value and there are no such things as junk miles. What about my “junk writing minutes”? Are they valuable, or are they a way to deceive myself about my writing progress? Undoubtedly, I should put some thought into improving the way I manage my sleep, work, and life, so that I can give quality undistracted minutes to my writing. Realistically, if I wait until I have time and energy to reorganize my life so I can write every day, it will never happen. If I only write on the days I have time to write well, I will never write. Theoretically, my life contains some days with enough time to write well and other days without, and I should be able to write on the good days. The trouble is, if I don’t write on the bad days, I won’t think of it on the good days. Even if I do think of writing on the good days, I won’t know what to write because I won’t have looked at my paper for a week or more. The “write every day” plan accomplishes one very important objective: It keeps me from hiding from my dissertation. Since I am not allowed to hide from it, I am almost forced to make forward progress, even if slow. Key to my streak has been my Excel spreadsheet writing log, which calculates the length of the streak and prevents me from cheating. I found it easiest to put together formulas in two different cells to do calculate the streak, instead of doing it all in one. Have I occasionally been tempted to skip a day? Yes. Why haven’t I? I knew I would regret it the next day. Also, I am scared of the consequences of letting the “write every day” habit end. If I quit, I may go back to what I was for far too long: a grad student who was making no progress (due to hiding from the dissertation) but who was unable to fully experience everyday joys of life (due to the guilt of the unprogressing dissertation). You can avoid working on the dissertation, but you can’t get rid of it except by finishing it. Even if you are hiding from it very effectively and haven’t looked at it in a year, you still must carry it everywhere you go, and it is heavy. Imagine carrying an invisible backpack full of invisible rocks everywhere you go. It really takes the fun out of life! How long will I keep up the writing streak? I don’t know. I have occasionally thought it would be neat to keep it going until the day I graduate (so yes, years from now), but we’ll see. I think the primary reason for continuing so far is that once I started, I wanted it to end on my terms. Cal Ripken didn’t end his streak of 2632 consecutive games by getting injured or by becoming such a bad player that the Orioles didn’t want him to play. He ended it by voluntarily removing his name from the lineup for the last home game of 1998. I’d prefer to do the same. Until then, let the junk writing go on! Racing with performance-enhancing drugs: Steroids really work! Ten days ago, I finally made it to an allergist, in hopes of finding out why my nose had been running on and off the last year (pretty much nonstop “on” all summer). I spent two and a half hours there, exactly the same amount of time I spent at the Department of Public Safety office in June when my driver’s license was up for renewal. During my stay at the allergist’s office, I received 3 different breathing tests, a CT scan of my head, a starter set of skin tests, two conversations with a medical doctor, and a detailed explanation of how to use/take medications and inhalers. All my tests were conducted by friendly, efficient, and competent technicians. My two and a half hours at the driver’s license office, on the other hand, included 25 minutes reading a research article, two hours of the Spider Solitaire app on my NookColor and a 5-minute consultation and eye test, conducted by a somewhat friendly, but not necessarily efficient, government employee. I left the allergist with a list of eight separate diagnoses, including various types of rhinitis and sinusitis, sinus polyps, and asthma. Apparently there’s a rip-roaring infection in every cavity in my head, and all the places that were supposed to be black on the CT scan were actually a mucky shade of gray. The allergist gave me a short lecture, rebuking me for not coming in much earlier and expressing hope that the mess could be cleared with drugs and that surgery would not be needed. Just the mention of that ominous possibility was enough to make me enthusiastically embrace the drugs, no questions asked. Instead of dinking around for a few days, perhaps reading up on side effects, hoping that maybe it would clear up on its own, and wondering whether the highly trained doctor was over-prescribing, I immediately filled all of the prescriptions and started taking everything exactly on schedule. I had already received my starter dose of steroids—the doctor’s office had given me the first dose while I was there, because they did not want any delay. The day after the doctor’s visit, I felt absolutely terrible, and was very happy I was giving tests because I don’t think I could have made it through an actual class. This was the first day I had really felt sick. The second day after the doctor’s visit, I felt a hundred times better, and I could finally breathe through that same nose that had not felt real airflow in a month. It was amazing!! 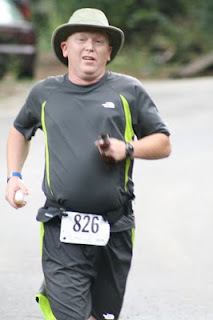 The third day after the doctor’s visit, I ran a 10-mile race, the 10 for Texas in The Woodlands. 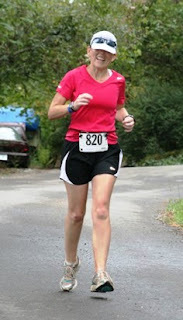 I ran this race last year, and had signed up for this year’s race quite some time ago. This week I had second thoughts, and briefly considered skipping it, especially when I felt so awful two days before. But no, I had already paid my money, and I didn’t want to end up with a race shirt that I would always feel funny wearing because I hadn’t actually run the race. I would do the race, but would keep my expectations realistic, and be content with going a little slower than I did last year. After all, I have only run about once a week for the last 6 weeks, and I haven’t done a double-digit run since August. (The Winslow Half-Marathon doesn’t count as a double-digit mileage run, because I walked up all the hills, meaning I walked almost as much as I ran.) So I was definitely undertrained, but was confident I would survive, even if it wasn’t especially fun. On race morning, I showed up early hoping to beat the traffic and also exchange my race shirt for a smaller one (mission accomplished!). After seeing breaks in the predicted clouds, I had second thoughts about leaving my sunglasses in the car, and I returned for them. Outside the parking garage, wonder of wonders, I ran into my sweet friend Mary Beth, there to watch and cheer on her husband Fred. This had to be a divine appointment, as there were two thousand runners, plus accompanying spectators and volunteers, and there was no way I could have expected to find someone I knew. 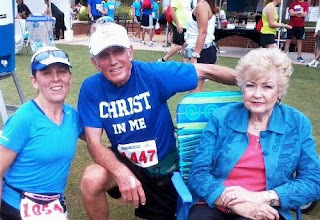 We visited for a while, took some photos, and settled Mary Beth into a chair near the finish line. In the Winslow race, my brother Dave Mows Grass utilized the strategy of finding a 64-year old woman to pace him the first few miles. Since this worked so well for Dave, I decided to try something similar. But I improved the strategy by 19 years, running the first couple of miles with my 83-year old friend Fred, the oldest runner in the race. We kept a leisurely pace, drinking in that special sort of camaraderie that is unique to the beginning of a running race. Everyone, even the slowest back-of-the-pack runner, seems to pick up on race-day excitement, and until that excitement starts to mix with tiredness, which will happen a little while later, feels strong and powerful, and very glad to be out running a race instead of at home in bed, or shopping, or cleaning the house, or all the other mundane bits of life that the rest of the world does on a weekend morning. After a couple miles, I felt stronger than I expected, so I said farewell to Fred and moved on ahead. I ran a couple of miles with someone who I discovered had finished less than a minute before me last year, and she recalled that last year, it was much cooler, in the fifties. It was still overcast, but getting warmer and would soon become a hot, muggy day. 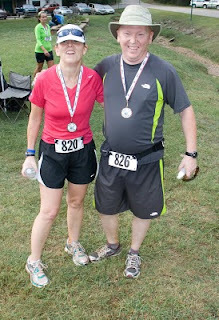 We chatted about how, especially with the heat, and for me also the sinus infection and total lack of recent running, we both expected to be a little slower this year. But somehow, in spite of all these difficulties, I felt pretty good, so I left my new friend, assuming she would catch up with me when I flaked out the last mile or two of the race. I didn’t chat long with anyone else, but just kept going. Somehow I kept steadily passing person after person, and only a very few people passed me the rest of the race. I noticed, not for the first time, an odd optical illusion. Nearly all the first half of the race seemed to be a slight downhill, which was fine and in fact very enjoyable, but I knew that what goes down must come up, and I fully expected the last half of the race to be a corresponding uphill. Fortunately, this did not turn out to be the case. The second half of the race was also nearly all downhill, all the way back to our starting point. Surprisingly, I didn’t become really miserable until after mile 8, and even when I felt wiped out and was tempted to walk, I somehow kept running. I finished in 1:45:21, four minutes faster than last year. How on earth did I do this? Why did the whole race feel downhill, even though it began and ended at the same location? Why was I able to pass twenty times more people than passed me? Why was I able to run faster in heat and humidity than I did last year, in twenty degrees cooler, perfect running weather? How was I able to overcome my total lack of training? Was it because I was well-rested? Well, resting a few days or a week might have been good, but I seriously doubt if resting for 6 weeks would improve running performance. Was it because of the training effect of the Winslow hills? Dave said that running Winslow without Hammer Gel was like climbing Everest without oxygen, so maybe there could be something there. Wait, it turns out I have asthma…wow, I guess I did run Winslow without oxygen! But hiking up some Winslow hills once couldn’t possibly cause me to be able to run 10 hot flat concrete miles at a 10:32 pace, faster than slowpoke me has ever done in my life. No, there can be only one possible explanation: the STEROIDS!! After only 3 doses, the steroids not only knocked down the sinus infection, but gave me the ability to run faster than ever before. It’s amazing, really. Unfortunately, at least running-wise, my steroid regimen ends tomorrow, so I will soon be back to my usual slow self. I am so glad I decided to run the 10 for Texas, and not just because of my steroid-induced personal record. I was happy for Fred that he managed to sneak in with a time just under 2 hours—I know he was pleased with his run. It was an absolute joy to spend the morning with Fred and Mary Beth. I am so grateful to have such friends, who remind me that this life is only temporary, and that the most important things are eternal. Fred had his shirt made before his first marathon. It says “The Hope of Glory” on the back (this mystery is described in Colossians 1:27). I realize that running is just a hobby, and that while it is perhaps a healthier activity than some other hobbies, there is nothing especially meritorious about it. But there’s something about running a race that reminds me just how much I have to be grateful for. Not just the ability to run, but every breath is a gift that should be cherished. My wonderful writing professor, without whose advice I would have made far less progress on my dissertation, cautions me not to binge-write. She argues for a writing model in which I schedule a writing session every day, and protect that writing session as an important appointment. At the end of each writing session, I am to plan the next writing session. None of these planned writing sessions should last more than a couple of hours. If the day’s schedule allows, I could schedule multiple sessions with breaks between them. I’m sure this is a marvelous model and that those who follow it are very productive writers. I certainly have no credibility to argue against it, as I am a terribly unproductive writer. I confess I have never followed this model, so can produce no evidence that the model doesn’t work. When my professor first told me about this approach to writing, I completely agreed with it and decided to do exactly what she said. Excited about my new plan, I dutifully scheduled, or at least intended to schedule, my next few days of writing sessions. Unfortunately, my good intentions did not suffice to overcome my natural selfishness and tendency toward laziness, and I did not follow through on my commitments. The primary problem was not so much that I did not protect my writing appointments, but rather that I did not make the appointments at all. When I look deep inside myself and examine my character, I find that among many flaws resides a strong sense of honor and honesty, and that I place a high value upon the keeping of promises. On the surface, this sounds like a good thing, and in some ways it is. Unfortunately, it is mixed with a large amount of pride, and too often I concern myself more with the keeping of a promise than about whatever or whoever caused me to make the promise in the first place. In other words, I sometimes keep promises with my hands but not my heart. I realize I am explaining this very badly…..and what does this have to do with my writing? The problem is that I much prefer to be a promise-keeper than a promise-breaker. I do not enjoy the feeling of shame that comes with failing to keep a commitment. Therefore I tend to only make commitments I can keep without too much trouble. So instead of making an actual writing appointment, complete with start and end time, and either keeping or breaking it, I have attempted to accomplish the same thing by trying to summon up warm feelings and enthusiasm toward writing, and a general sense of dedication toward making progress. Is it possible to finish my dissertation or become a productive writer with this approach? Will I grow up, change my ways and actually schedule, on paper, with an exact start time, my daily writing sessions? Will I learn that the most important commitments are those that require pain to keep? Will I be willing to set high standards, and accept the risk that I may fail to meet them? I simply do not know. I am not sure whether scheduling my writing appointments would improve the writing rhythm I seem to have recently developed, or disrupt it. In the words of Gimli the dwarf, “Sworn word may strengthen quaking heart.” The wisdom of Elrond responded, “Or break it.” So, I will follow Elrond’s advice and go on my journey with a good heart, not looking too far ahead and trusting that a blessing rests upon my endeavors. Surely I will muddle through somehow. The original title of this post was “What is the Optimal Proportion of Binge Writing?” I planned to argue that my professor’s writing model could be improved by supplementing the daily writing sessions with regular binge-writing sessions, in which I write nearly all day, or all night, or both, or maybe even for most of a weekend. But I have discovered that once I start writing about something, it takes on a life of its own and wanders off to unexpected places, and sometimes it is simply impossible to regain control. Maybe that’s okay—according to my brother Dave Mows Grass, good blog posts are supposed take a sound point and turn it into a rambling screed. That has certainly happened here. Since this weekend is scheduled (well, if not scheduled, at least intended) to be a weekend of binge writing, then maybe next week I will be better equipped to either defend or denounce the addition of binge writing to the productive writing model. As I see it, there are 3 main ways that jobs can pay money: by the Hour, by the Task, and Salaried. I should note that some Salaried jobs are really Hourly jobs in disguise…if you are required to keep track of the hours you work, or make up for time you missed, then it’s an Hourly job. If you get paid overtime for working extra, it’s an Hourly job. Since working on a dissertation doesn’t pay money (it actually costs money), I am allowed to choose whether I want to think of it as Hourly, by-the-Task or Salaried. By-the-Task sounds like a good idea, but since I have yet to finish a single dissertation-related Task, I am not optimistic about this approach. Even if I break down the big Tasks into small pieces that can theoretically be done in a day, I know that frequently they will take much longer than I expect (everything does! ), and I will give up in despair. If I can’t even finish my single Task of the day, why should I work on research at all? Thinking of the dissertation as a Salaried job is an even worse idea. With a Salaried job, all I have to do is pretend to work. I’m neither required to complete certain Tasks, nor work a fixed number of Hours. So I could potentially pretend to work on my dissertation for years at a time, continuing to receive my paycheck (remember, it’s negative! ), without ever getting any closer to my degree. I must confess that I have done this at times, sometimes for long stretches, but it is definitely a bad plan. My only hope is to think of my dissertation as an Hourly job, one that requires me to work a certain number of hours each day or week. If I can’t do the scheduled hours one day, I need to make them up later that week. (I think this is called comp time, but I’m not sure, since I have almost no experience with Hourly full-time jobs.) If my paying job were an Hourly job, I would be very motivated to work the required number of hours, because I would know that if did not do so, I would get fired. Unfortunately, the Hourly research job does not pay money, which means I will have to trick myself into meeting the Hourly requirements. I also (fortunately or unfortunately, not sure which) am unlikely to get fired from the Hourly research job, at least not for a couple more years when I reach the 10-year limit on doctoral studies. Texas A&M would be silly to fire me, as I am a reliable source of income for the university. I cheerfully pay my tuition each semester, while utilizing a very small portion of the resources which my fees support. I am probably a net taker when it comes to the Library Use Fee ($26.45), and perhaps eventually the University Writing Center Fee ($8), but I am definitely a net contributor to the Instructional Equipment Enhancement, the Transportation System, the Recreational Sports System, the Student Center Complex, Student Recreation Center, and the Career Center, for which I pay fees of $75, $72.50, $70, $101.92, $100, and $6.75, respectively, without using them at all. I pay the same $275 for parking as full-time students who are on campus every day, even though I live 70 miles away and come to campus only occasionally. Why on earth would A&M have a 10-year limit? They should be trying to keep me there forever! Of course all this sounds suspiciously like whining, which I honestly did not intend, and is completely off the point. Back to my musings on Hourly jobs…. Another problem is that I have very rarely had Hourly jobs, so I am not used to this. Being required to work a certain number of hours each week is a foreign concept to me. My newspaper-throwing job, which I held for 6 years, was a pay-by-the-Task job: I received a fixed number of pennies for each newspaper I delivered. Thus all my energy was directed into finding ways to shave a few seconds off my total paper-delivery time. Besides continually re-mapping my route, I was always trying creative new schemes, such as hauling my paper bundles to the apartments in advance, or retrofitting giant trash cans with high-tech wheels to withstand the wear and tear of hundreds of 6-pound big-city Sunday newspapers. Except for a select few who copied my schemes, most of my fellow paper carriers thought I was insane, and were satisfied to simply deliver their papers the same old way year after year, with never a thought of improvement. I did track my Hours, as one would with an Hourly job, but only so that I could track changes in my pay rate per hour and per ton of papers delivered. In a way, the research job is a by-the-Task job, as my only required Task is to write one dissertation—when the Task is finished, I will receive a degree. But somehow having one giant Task that must be done in small pieces over a hundreds of days is far more intimidating than having hundreds of little Tasks (like newspapers) that must be done in one day. In a way, my current paid job is a by-the-Task job, because I am required to teach a certain number of classes each semester. However, it is not a true by-the-Task job like the newspapers, because the goal in teaching classes is not to get the classes taught with a minimal amount of time and effort each week. Can you imagine a student ever saying, “Wow, that was a wonderful class! That professor did almost nothing the whole semester, what an efficient job of teaching!” For every class taught, I have probably invested more time than just the minimum to get by, but far less than I should. As a new colleague shared with me just today, “Class preparation will take as much time as you let it”. Since no one really knows how much time is “enough” when it comes to preparing a class, I really don’t know if I’ve done “enough”. Since “enough” is not well-defined, teaching is a Salaried job, not a true by-the-Task job. It is definitely not an Hourly job, as I don’t have to track my hours, or make up for days when I work fewer hours than usual, and I don’t get paid overtime. Part of the problem with making research an Hourly job is my continual uncertainty about how much is “enough” time to spend on the Salaried teaching job. I do not want to shortchange my students—it’s not their fault they happened to get an instructor who is working on a dissertation! The issue is balance…balancing the needs of job, school, and family, balancing short-term goals versus long-term goals, and so on, and becoming at peace with the fact that not everything will be done optimally. Doing one thing optimally usually means doing another sub-optimally, and that’s okay, as long as we are optimizing the most important thing for that time. We must make careful choices, counting the cost of each choice, and praying continually for wisdom, from him who gives it generously and without reproach (James 1:5). So, well-wishing friends, let’s all remind one another that it’s okay for some things to be done imperfectly, as long as those things are chosen with wisdom. And let's be patient with one another, realizing another person's priority may not coincide with our own. Why on earth would I spend two hours trying to fix my blog so the archives show on the side where they belong, instead of at the bottom where no one can find them? I have no idea. I don't know why I should care about this, but I do. It's not as if I expect anyone to read this blog--it was created purely as a motivational tool for myself, so that I could practice writing and hopefully learn to enjoy it. So, the purpose of this particular post is so that I can see whether Blogger simply didn't like my previous entry, about progress and bad days, or whether it doesn't like anything I write. Whatever happens, no matter how badly my page is messed up, I will force myself to abandon, at least for this evening, the silly task of trying to fix my unread blog. Instead, I will watch the first lesson from the Remedial Swimming video I just received from eBay, then go to the gym to try it out. I can go play guilt-free, because I already kept my writing appointment for the day!! Update: The reason I spent over 2 hours trying to fix a blog no one reads is that I am too dumb, proud, or something, to scroll through the Blogger help forums to see if anyone else has ever had the same problem. Once I did that, I discovered the culprit was a stray </div>. Once it was obliterated, not only did my archives come running back home, but all the links, stubbornly unclickable in Firefox, magically came to life. If my time-wasting resulted in a lesson learned, then it wasn't totally wasted...hopefully I learned my lesson. Here, I got two lessons for the price of one: a Remedial HTML lesson, and a Read the Tech Help lesson. Thank you, Blogger techies! After a couple weeks of excellent writing progress, I’ve fizzled…or at least, my momentum has lessened. When things were going well, I could easily spend at least a couple consecutive hours writing, generating and editing quite a few paragraphs, enjoying it at least somewhat, and feeling pretty good about what I’d written. The last week or so, the paragraphs have been painful to come by. Sometimes I have found myself watching the clock, in hopes that the slow-moving writing minutes would slide by a little more quickly. The beginning of my good writing stretch coincided with my resolution to work on my dissertation four hours each day (it is a full-time job, after all!). 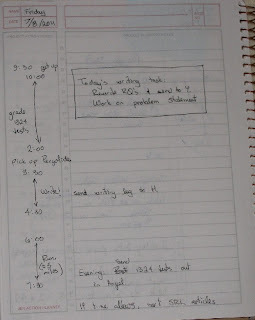 Some of the bad writing days occurred when, due to circumstance or poor planning, I did not get in my 4 hours, or I waited until 10:00 p.m. to start, resulting in an even more screwed-up sleep schedule than usual and decreasing the probability of doing well the next day. We recently spent a weekend in Corpus Christi for a mini-vacation (yes, I worked on my dissertation and maintained my writing streak in the hotel room). One afternoon, I went for a run on the seawall jogging trail. Expecting to get in 5 miles, I found myself totally wiped out after less than 2. I was hot and miserable, and the whole thing just felt like it was uphill (it wasn’t, flat as a pancake). I started taking walk breaks at 2 miles, and whenever I started running again, it didn’t last long. Eventually I gave it up and walked back to the hotel, feeling pretty unhappy about my lack of discipline, and having serious second thoughts about letting Dave Mows Grass talk me into the Winslow Half-Marathon next month. According to the technology genie on my wrist, I went 4 miles before turning it off, but I’m sure I only ran 3 of those. The more I thought about it, the less discouraged I became. Hey, I just ran three-fourths of a 4-mile stretch of sun-baked concrete, no shade, at 95ºF, and who-knows-how-high humidity. Three years ago, would I have ever dreamed I could do such a thing? Heck, I couldn’t run to the end of the block! So this bad day, far from being cause for hopelessness, is actually a miraculous victory. One more thing: guess what happened the very next day after the aborted run on the seawall? Scott dropped me off at Texas A&M-Corpus Christi, and I ran 11 miles back to the hotel! And enjoyed most of it! In spite of a few bad writing days, my writing streak now numbers 31 days, exactly 15.5 times longer than my previous longest writing streak. And while today was not a great day dissertation-wise, as I spent a good chunk of it being a lazy bum, I still got in over an hour of productive writing. Even better, I didn’t mind doing it, and quit while I still had some momentum. Hopefully that will carry over into tomorrow’s session. A couple weeks ago, I was really excited about my progress. I was consistently working 4-6 hours each day, including at least a couple hours of writing, and mostly enjoying it. I actually felt there was hope for me as an academic writer. Then, everything slowed down. It became hard to write even a paragraph. I’ve been keeping at it, and have been writing each day, but it isn’t fun lately, and I’m feeling frustrated. So, instead of despairing, I reminded myself that this entire dissertation journey is an experiment, with n = 1, and I went about the task of analysis. In part, I attribute my decreased writing momentum to the fact that I’m working on a different section of my paper, one I enjoy less. I have devised a theoretical model of how the process will work: for each section, I’ll struggle at the beginning, just getting it organized and off the ground. Then hopefully, I’ll get some momentum and go faster. Then I’ll run out of steam on that part and it will go slow again (by the time I got done writing about propensity scores, I was sick and tired of writing about statistical analysis, and so found it very difficult to dredge up enthusiasm to explain my logistic regression and chi-squared procedures.) It’s like pushing off from the wall in swimming or pushing a sled across the snow—you start from a standstill, then get some momentum and pick up speed, then the momentum dies and you have to start over. Only time will tell if my model is supported by actual practice, but it sure makes sense! If I think of my dissertation rate of progress as a function of time, there is no reason to expect it to be constant. There is also no reason to think it will be an increasing function, in which I get better and better, and progress gets faster and faster. So, since I don’t expect an upward trajectory, I shouldn’t get down when I hit an occasional low spot, as long as progress is continuing. I need to learn to distinguish the occasional low spot, which is no cause for alarm, from an actual quitting/fizzling, which would indeed be a bad thing. I suspect that writing progress will be a series of peaks and troughs. Screwtape, in his Letters VIII and IX, describes the Law of Undulation and warns junior tempter Wormwood to never let his human suspect that peaks and troughs are a normal part of the spiritual journey (C.S. Lewis, The Screwtape Letters, 1961). According to Screwtape, the Law of Undulation applies to every area of life, including interest in work and affection for friends. He doesn’t specifically mention writing, but I am sure it applies there too. Screwtape says that the best growth (from our perspective and God's, not Screwtape’s!) actually occurs in the troughs. If that’s the case with writing, I should be in great shape! I know it’s hard to believe, but this expert writing avoider has now written for at least 30 minutes on 17 consecutive days. At first, I didn’t want to call it a “writing streak” even to myself, much less announce it on a public blog. I don’t believe in jinxes, but I knew how humiliated I would feel if my writing streak fizzled out and died right after I told all my friends about it. Once I cracked the 2-week mark, I started to feel I might be able to keep it up. I realized that if I were going to track a writing streak, I needed a good definition. It drives me batty when people write about a construct without clearly defining it. I knew there should be a minimum requirement for a writing day to count as part of a streak….five minutes of writing just wouldn’t cut it. The United States Running Streak Association defines a running streak as running “at least one continuous mile each calendar day under one’s own power”, then clarifies some details, including the legality of prosthetic devices and the illegality of crutches and pools. When I read that a running streak doesn’t even count until it reaches a year in length, I was dismayed—I had been pretty proud of my 18 miles across three consecutive running days over the weekend. When I found out they were worthless as a running streak, I decided there was no point trying to add to it and I might as well laze on the couch for a few days. If there is a United States Writing Streak Association, I didn’t find it. Perhaps it exists, but is just not sufficiently popular to make it to the front of the search pages. Thus I was left to my own devices for a writing streak definition. In keeping with the spirit of the running streak definition, I felt the writing requirement needed to be sufficiently stringent that it would accomplish something worthwhile, yet reasonable and not so demanding as to be unrealistic. Rather arbitrarily, I settled on 30 minutes. If I were trying to maintain a running streak (which I’m not! ), it would probably take me about 30 minutes to squeeze in a mile, counting clothes-changing and post-run shower, if I ran out the front door instead of going to a nice running place. Knowing my night-owl tendencies, I opted to define the day as ending whenever I went to bed, regardless of which date is actually on the calendar. Thus if I write at 2:00-2:30 a.m. Thursday morning, that counts as Wednesday writing. The 30 minutes has to be “pretty much continuous” (how’s that for a clear definition? ), meaning that it’s okay to pause and scratch my head occasionally, or look up a reference, or to read a bit of an article and then write about it, as long as the primary activity is still writing. If the session morphs into a reading or database-searching session, it now qualifies as non-writing dissertation activity and doesn’t count as part of the writing streak.One more very important note: Only dissertation-related writing counts for the streak or gets put in my writing log. Recreational writing, such as this blog, doesn't count!! After I officially defined what must occur to add a day to my writing streak, I looked at my writing log, and was disappointed to find out that the first three days of my streak had dropped off. Day 3 was only 28 minutes, so my alleged streak had to start over from 1. I briefly considered changing the definition so I could get my three days back, but thought better of it. Researchers are not allowed to change their hypotheses after the experiment is underway. So what I thought was a 20-day writing streak became a 17-day writing streak. That’s okay. When I created a spreadsheet formula to add a writing streak column to my writing log, guess what I discovered was my previous record for a writing streak? To my shame, it was 2 days. Yes, a lousy 2 days is the best I had ever managed since I started the writing log a little over a year ago, when I went to my first writing workshop. I knew I had been terribly inconsistent, but I really expected to find some several-day streaks in there. Oh well, there’s no point in lamenting over the past. All I can do now is go forward. Hopefully the current streak will go for a while. I’m glad I decided to count it as a streak now instead of waiting for a year like the running streak people! Yes, I still cannot believe it, but I actually enrolled in Remedial Swimming. That is not the official name given to it by the swim/scuba business, but that is what it is. I refuse to call it Developmental Swimming or Transitional Swimming, as if it were a math or English class offered by an institution of higher learning. Such euphemisms have no place in this blog. The only reason I signed up for it is because my friend Yegan (who also teaches developmental math) talked me into it. Once again, I discover I am just like my students—I am going to school simply because my friends are! (Gee, we’re all humans…why shouldn’t we be alike?) Actually, while being able to share lessons with a friend is a nice plus and is the reason I chose this particular summer to learn to swim, it is in fact something I have considered before, because I always wished I could swim, but as with so many other things, I’ve just never gotten around to it. I have managed (at least mostly) to get over my ego and not feel self-conscious about my total lack of skill in this area. I am even willing to practice in the lap pool at my gym, splashing around the shallow end and coughing up water, while other people gracefully swim lap after lap, or sit on the bench in front of the steam room talking (I’m sure they have more interesting things to talk about than the ineptitude of people in the pool). There is nothing whatsoever wrong with being enrolled in Remedial Swimming, or Remedial Anything (at least that’s what I keep telling myself). Remedial Anything simply means that you did not learn Anything at the time Anything is typically learned, so you have to learn it later. I have known outstanding students, excelling in calculus and above, who began their college careers in developmental math. Every time I teach a developmental math class, I remind myself that I may have a few future rocket engineers in the bunch, who are way smarter at math than me. I wonder if it has ever occurred to my Remedial Swimming instructor that perhaps Yegan or I will be a future Olympic swimming champ? Yegan started Remedial Swimming at least a couple of weeks before me (talking me into it was a difficult and time-consuming project). She said that she was absolutely terrible at swimming, sank like a rock, and flailed her arms and legs without going anywhere. So I thought I would be ahead of her, because at least I could float on my back and dog-paddle across the short length of the pool. But this apparent head start did me no good whatsoever, because on my first day of class, the instructor didn’t ask me to dog-paddle across the pool or float on my back. She asked me to lay horizontally on the water with my face in it, and kick my legs. On the second lesson, she added arms. I am supposed to stroke through the water with my arms, turning my head to breathe with each stroke, all while continuously kicking my legs and staying horizontal. This is, of course, impossible. I have never even been able to pat my head and rub my stomach at the same time. How could I possibly move my arms one way, my legs another, and my head another, all while laying face-down in a substance that has been known to kill people? As I discovered last night, I cannot even run on a treadmill while watching Xtreme Skateboarding (whenever a skateboarder wipes out at the top of the halfpipe, I step off the side of the treadmill). Remedial Swimming Lesson #3 is tomorrow. We shall see what it holds. After upping her Remedial Swimming attendance to four times a week, Yegan can now swim halfway across the lap pool without stopping. I am only attending Remedial Swimming once a week, so it may take me until Christmas to be able to swim across the pool. I certainly hope not—I don’t think my ego can take a beating for that long! 1. When you download an article, give it a file name that includes the author, year, and something about the topic. Do not give the file a generic name like “community colleges” or “mathematics”. 2. If you scan or photocopy a book chapter (be careful to obey the copyright laws and not copy too much! ), write on the copy the title, author, and year of the book it came from. Better yet, scan/copy the cover page of the book that has the title and author. If you do not do this, you will have a pile of chapters with no way of telling what book they were in or who the book editor is. 4. If you read a research article, write a paragraph about it either while you are reading it, or immediately afterward. If you do not capture your thoughts at the time of reading, you will read it a year later, thinking it is a brand-new article (until you discover your highlights and notes in the margins of page 3). Writing a dissertation takes long enough without duplicating work! 5. Use hanging folders to organize articles, not regular file folders. If you use file folders without putting them inside hanging folders, all the folders slide down into the bottom of the file box and won’t stand up properly. This makes it hard to find things. 6. If you print an article, immediately put it into a folder with a descriptive label, even if you don’t think the article will be relevant to your dissertation. It is still good to know what’s where! And it is far more satisfying to have a large box of neatly filed and organized useless articles than to have a bunch of useless articles in a pile in the corner. 7. Invent a good way to organize your downloaded articles instead of stuffing them into electronic folders labeled “articles already printed”, “articles may or may not be useful” and “articles to be printed”. 8. Before writing too many random paragraphs that are marginally related to your topic, come up with a plan for organizing your lit review. This will hopefully keep you from having too many articles on one subtopic and none at all on other important subtopics. 9. Buy a good laser printer and don’t feel guilty about using it. The price of toner and an occasional replacement drum is small potatoes compared to the cost of graduate school. 10. Don’t buy cheap thin paper. It wrinkles up when you try to print dense text on both sides. Graduate school is stressful enough without adding preventable stress sources! looking through book stacks just to see if anything jumps out to me…found a good book! Libraries are amazing places. It may not be a spectacular day, but if all my days were like this, I wouldn’t have much to complain about. Hooray! I got a full-time job!! Yes, in spite of the terrible economy, I managed to find a new full-time job! This particular job comes with a couple of disadvantages, but I am still grateful to have it. The first disadvantage is that it doesn’t pay anything. In fact, it requires me to pay a substantial fee for the privilege of having the job. But that is okay, because I already have a full-time job that pays actual money. My duties for the paying full-time job ended, at least for the most part, on this past Wednesday, when I turned in my summer school grades. This leads to the second disadvantage of the new unpaid full-time job. It will only last for 5 weeks. Then it will revert to part-time status, as my duties for the money-paying job will resume. At that time, though its status will have changed to part-time, the summer unpaid job (or more accurately, the negative-pay-rate job) will still require full-time work. That work will simply have to fit into a part-time schedule. But there is no need to worry about that now. For now, I plan to just enjoy the bliss of having a full-time job. Since the job is full-time, that means I must do what other people with full-time jobs already do: work their hobbies, sleep, exercise, and other duties of life into the available time around their full-time jobs. For example, if I were silly enough to try to maintain and train a horse, run sufficient miles to survive the Winslow half marathon, or take swimming lessons with a friend, these hobbies would need to be secondary in priority to the full-time job. I realize that to most people, the notion of arranging hobby time around a full-time job seems normal. It is certainly not sufficiently interesting to merit several paragraphs of this inconsequential blog, or the bandwidth to hold them. But for me, this is a new concept and I will have to make some serious adjustments. The problem is that I have not had a normal full-time job since I was 23, when I decided to leave my very well-paid engineering gig to throw newspapers (among other things). I have had jobs that paid full-time money and occupied more than 40 hours each week. This includes my current paid job, which is described and advertised as a full-time job. Though it comes with plenty of hours and a full-time paycheck, it acts like a part-time job in the sense that I keep odd hours and do much of my work at home. I very much enjoy teaching night classes, but they do not tend to promote a set schedule. I live like a college student, frequently staying up late, working on weekends, and pulling the occasional all-nighter. As long as I work around meetings and my day classes, I can do some non-work things during the day. So, I am a 42-year-old person still living the life of a college student (Oh, wait, I am a 42-year-old college student—maybe this makes sense after all!). Anyway, for the next 5 weeks, the new negative-pay-rate full-time job needs to take priority. Like my paid job, it has some flexibility and no one is watching over my shoulder. So if I am not careful, the hobbies and relaxing will take over the hours that should be devoted to the job, and this wonderful 5-week opportunity will slip through my fingers. So, well-wishing friends, when you see me, please help keep me on track by asking me how my new full-time job is going. And whatever you do, if you want what’s best for me, do not attempt to talk me into any more hobbies or recreational events!! I considered calling this type of post a “Cool Product Pick of the Week”, a catchy title lifted from Dave Mows Grass. I tried for quite some time to think of an original title. After all, I am an academic, and very aware of the perils of plagiarism. I do not know whether the title is original with DMG, or if he found it somewhere else. His name is definitely catchy, though, and once it was in my head, nothing better could get in. Fortunately, my product is the Visual Thesaurus, so I could use the product itself to help create a title for the post about the product. What do you think of it? (to get snazzy, I had to move an extra generation away from cool….somehow fashionable and stylish didn’t seem to fit my product of the week…er, hebdomad.) I also couldn’t find a way to incorporate Cartesian Product into my title, but was rather impressed that VT knew about it. This is a wonderful thesaurus, much better than your standard thesaurus which simply gives a list of words, and exponentially superior to the synonym finder embedded in Word, which doesn’t seem to realize that study is a noun. 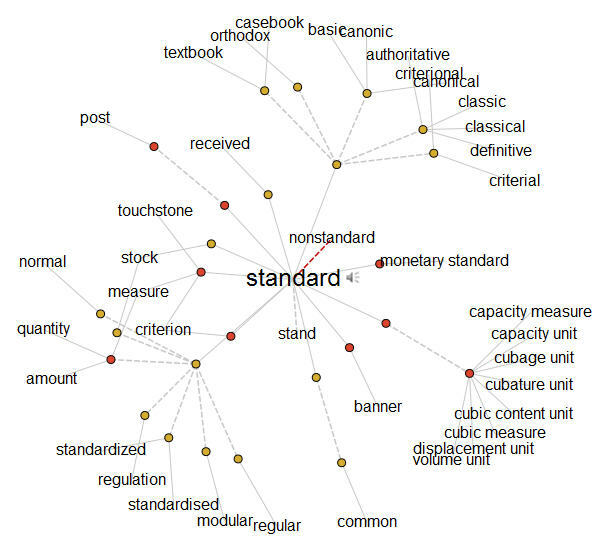 Contrast Word’s thesaurus with Visual Thesaurus, which not only understands that study can be a noun, but knows it can be a room, a subject area, a bailiwick, a sketch, a written report, any of several musical compositions, as well as state-type nouns like engrossment, immersion, absorption, and concentration. 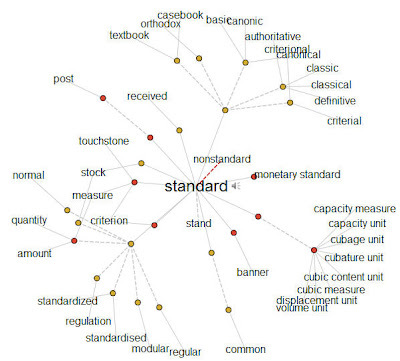 VT creates a map of your word and all its synonyms and related words, arranged in clusters of related words. If you click on a synonym (or antonym), you get a new map, complete with new clusters, centered upon your new word. Visual Thesaurus will also list the definition of your word, and you can hear your word enunciated correctly by an American or British mechanical voice (your choice). Often you’ll see example sentences, such as “He’s a cool dude” illustrating the various meanings of the word. The price is only $19.95 a year, which is 2.477% of the cost of one credit hour of graduate research at Texas A&M University. I consider this an excellent deal. If I ever finish my dissertation, I will probably keep my subscription…the pay raise my institution gives for doctoral degrees is not large, but it would suffice to cover VT’s $19.95 yearly fee. Now that I’ve started using this wonderful little tool, I just can’t imagine writing without it! Throughout my life, I have been prone to occasional bouts of inspiration, of varying length, in which I feel motivated to change my drifter tendencies and become productive. Often these episodes have resulted in the purchase of a new planner, calendar, or organizational system. Fortunately these have rarely been of the electronic variety, thus minimizing the financial consequences of the episodes. While I appreciate the benefits of technology and am very glad not to be writing a dissertation in the era of typewriters and ditto machines, I know myself well enough to know I will do better with paper. My most recent planner purchase was this past winter. I already had a paper calendar that served me well, but I wanted something in which I could map out my days hour-by-hour, a whole day at a time, including of course my scheduled and protected writing session. Knowing that a generic spiral notebook would never suffice to plan my days, I set off in search of the perfect planning notebook. My yearly calendar purchase usually takes several store visits and revisits, as it is difficult to find a calendar that has colors both pleasant and cheerful, paper with a nice feel, and lines that are neither too narrow nor too dark. However, after visiting just two stores and feeling rather proud of my decisiveness, I purchased a planner. I liked the paper, I liked the lines, and the price was right. I wasn’t thrilled with the dull black cardboard cover, but was willing to overlook it if it could help me finish my dissertation. When I arrived home, I removed my new planner from the bag to plan my tomorrow. Guess what I found, stamped in gold, on the plain black cardboard cover? 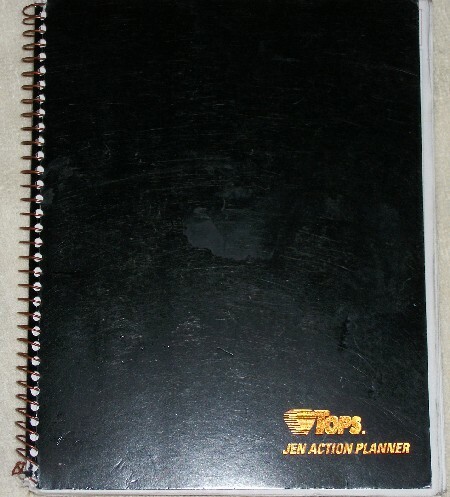 Yes, indeed, its official name is the “Jen Action Planner”. It even has “Jen Action Planner” on each of the pages. Why on earth would a company name a notebook the “Jen Action Planner”? Clearly this notebook was meant for me. I don’t know why I didn’t notice the name when I was in the store. My eye must have skimmed over it, assuming it said “Jet Action Planner” or just “Action Planner” or some other sensible and inspiring name. Anyway, I proceeded to make a plan for the next day. I followed through on my plan, at least mostly, got a lot done and felt great about my day. For each of the next few days I planned my time the night before. Then, for some reason, I quit. Since then, I have occasionally planned a few days, but I haven’t been consistent. 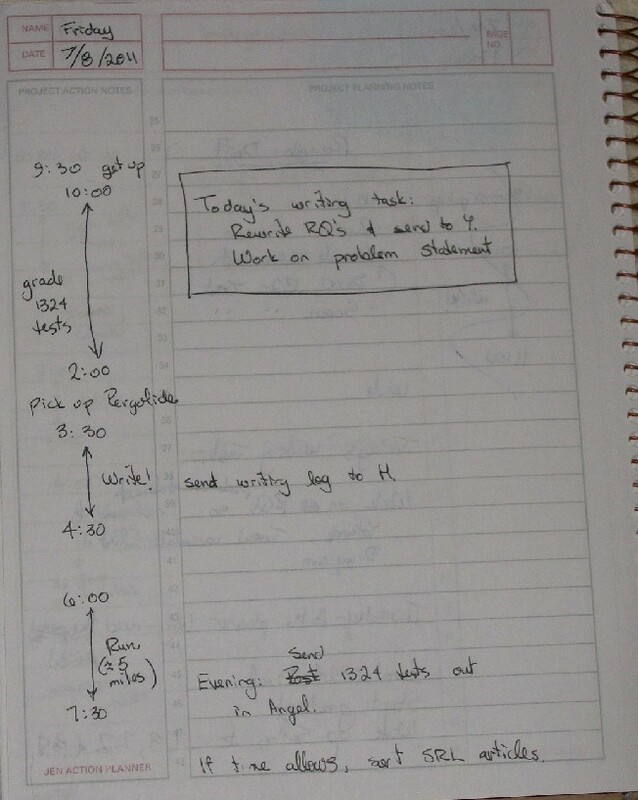 I noticed the planned days resulted in more productivity than the unplanned days, yet I didn’t persist. I have used my calendar to keep up with meetings and other obligations, but my unspoken-for hours have slipped through my fingers, never to be seen again. I ask myself now, “Why am I so unwilling to plan?” I think it is because I am very selfish, and want to reserve the right to do what I want when I want to do it. I don’t like feeling guilty or miserable because I didn’t do follow through on my commitments. If I don’t set any goals, then I can’t be a failure for not meeting them. I know better. I know that every day is a gift, and that I need to be a better steward of the gifts God has given me. In an effort to use my hours more wisely, I have dusted off my Jen Action Planner, and have planned my tomorrow. Yet I realize that I am not the One who holds tomorrow, and that some unexpected adventure, better than all my plans, may be sent my way...I want to be ready to welcome it.